A hearing loop system is simply a thin strand of copper wire that radiates electromagnetic signals that can be picked up by the small receiver (t-coil) built into most hearing aids and cochlear implants. The hearing loop system allows the person to hear only the sounds coming directly from the microphone not the usual background and interference noise. In most places, hard of hearing people hear the broadcast sound, but only after it has traveled some distance from a loudspeaker, reverberated off walls, and gotten mixed with other room noise. Hearing loop systems take sound straight from the source and deliver it right into the listener’s ear. It’s as if one’s head was located in the microphone, or inches from a television’s loudspeaker—without extraneous noise, or blurring of the sound with distance from the sound source. Think of the hearing loop system as the equivalent of a wheelchair ramp for people who used to be socially isolated because of their hearing loss. People with hearing aids will immediately recognize how the loop system can enrich their lives. Hearing Loops are a cost effective way to improve communication for the hearing impaired population, while conforming to ADA guidelines. 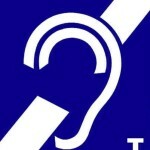 The photo displayed is the Universal Sign for communicating that the facility is using the Hearing Loop System. Look for it in public places. The hearing loop technology, which has been widely adopted in Northern Europe, has the potential to transform the lives of tens of millions of Americans, according to national advocacy groups. As the loops are installed in homes, auditoriums, theaters, retail stores, banks, museums and other public spaces, people who have felt excluded are suddenly back in the conversation. Almost any room or facility can be looped. Hearing loss effects 17% of the adult US population; a number that is increasing as the population ages. As of March 15, 2012 all newly constructed or altered state and local government facilities must comply with the 2010 ADA Standards for Assistive Listening Systems. This entry was posted in hearing loop and tagged hearing loop, t-coil by admin. Bookmark the permalink.